Home fashion featured magnolias pink pleated skirt pleated skirt spring spring fashion spring look spring outfit travel Washington washington D.C. Blossoms In D.C. But anyway, I actually styled this skirt for a more work appropriate setting and received a ton of compliments when I wore it in office last week! So naturally, I wanted to share a couple of ideas for styling this piece in the upcoming months. 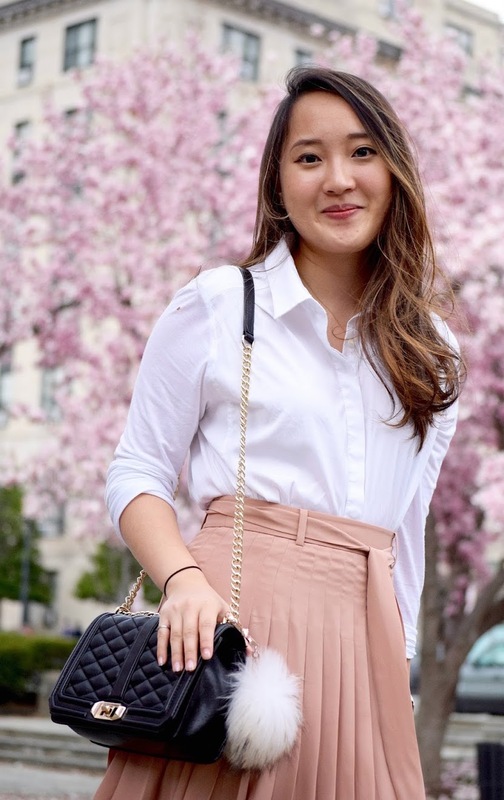 I originally wore this skirt while visiting D.C. for the cherry blossom festival about two weeks ago...of course, we'd gone a little too early and there were only a couple of early blooms, but we did find an amazing location that had a ton of magnolia blossoms. I believe that this is the area right next to Rawlins Park--if any of you are going to be near there or visiting, I definitely recommend checking it out! It looks like a great place for an afternoon lunch break, with tons of benches for seating and gorgeous blooming magnolia trees all lined up! To me, this skirt perfectly embodies the essence of spring--the light weight material combined with the pleated design and rose quartz color encompasses the spring spirit. This piece is definitely going to be on rotation in my wardrobe for the season! Seriously can't wait to dress this skirt up with an embellished top for a fancier occasion, or even pair it down with a loose, oversized t-shirt and some loafers for the perfect weekend look...not to mention, it would also be great for any Easter Sunday plans a little later today! Wishing you all a happy Sunday and a happy Easter to those who are celebrating!